From left to right, Brett Sublett, Kyle Curtin, Tate Lagasca, Holden Rennaker and Shaun Burke. 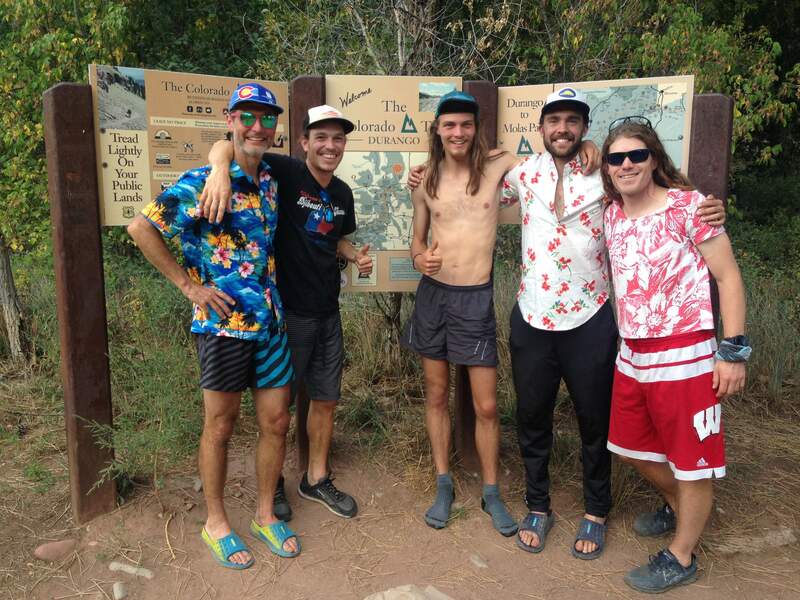 The five Durangoans completed a relay run on the Colorado Trail, about 485 miles, in 3 days, 15 hours and 54 minutes. Five Durangoans this weekend completed the first ever round-the-clock relay run on the Colorado Trail, which stretches from Denver to Durango. In the process, they set a record time among all trail users. The group completed the 485-mile trek in 3 days, 15 hours, 54 minutes. There’s no official tally of times set on the Colorado Trail, but the group says their finish time beats a supported runner’s record set earlier this summer at 8 days, 30 minutes, and surpasses even a mountain biker’s record time of 3 days, 20 hours, 46 minutes. “It was hard,” said Tate Lagasca, 23. The group started at the Waterton Canyon trailhead outside of Denver at midnight Thursday, with Holden Rennaker, 26, taking the first shift, completing about 17 miles. They then used a shuttle of two cars to keep switching out runners along the way. “It was like a game of leap frog,” said Kyle Curtin, 30. For the next three days, the group endured little sleep and long bouts of running. They were aided by the light of a nearly full moon, but that didn’t stop the mind playing tricks at night. “The wildlife at night was probably the scariest part,” Rennaker said. The group finished Sunday afternoon. In total, individual mileage: Curtin (108 miles), Rennaker (106 miles), Lagasca (101 miles), Shaun Burke, 30, (100 miles) and Brett Sublett (70 miles). Sublett, 51, said he came up with the idea to complete the relay on the Colorado Trail when thinking about similar races, which usually occur on roads. Though the group holds the record for relay running on the Colorado Trail, they’re ready for challengers, they said while taking a much-deserved rest at the Junction Creek trailhead in Durango, the end of the Colorado Trail. Sublett said one of the reasons they organized the relay run was the hope it would kick start a friendly competition between other trail running towns. “We’re hoping it inspires people to try and beat that,” Sublett said.